Native American food traditions have almost been lost to history. One Apache chef is reviving them. 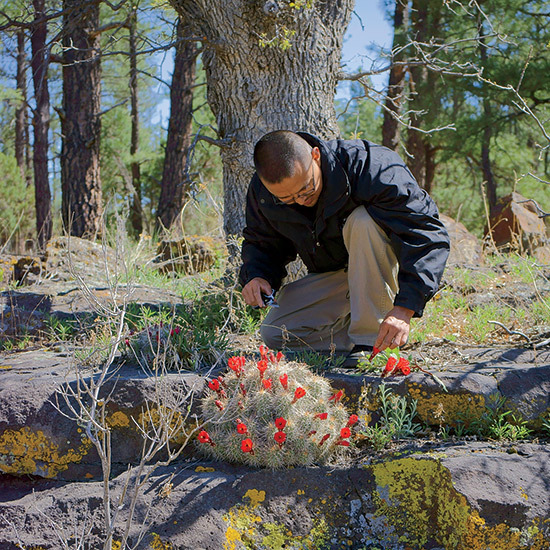 In summer's copper twilight, Apache chef Nephi Craig collects wild tea from the foothills of Arizona’s White Mountains, just as he has every year since he was a boy. Like generations of Apache before him, Craig gathers it in a deliberate, contemplative way—careful never to pull it up by the roots, so it will grow back. For centuries, Apache have steeped these tawny stalks to brew a reddish-orange drink that helps cure colds and connects their people to the traditions of their ancestors. But Craig uses wild tea and other foraged flora to create a different kind of link—one between this isolated corner of Native American country and the wider culinary world. As he fills his basket, Craig climbs to 10,000 feet, an elevation from which he can take in the peaks and valleys of the mountain range where Apache have always collected, cooked and eaten the plants they found. Finally, he reaches Summit Restaurant at the Sunrise Park Resort Hotel, where he uses foraged ingredients in his remarkable tasting menus—his pioneering take on Native American cuisine. Craig graduated from culinary school in 2000 and worked his way up at Mary Elaine’s, a venerable, now-closed French restaurant in Scottsdale, Arizona. His training continued in kitchens all over the world—London, Osaka, Cologne, São Paulo—before he returned to the White Mountains and his interest turned to the edible landscape around him. Summer in the pine forest of the White Mountains brings an abundance of meadow rue, a peppery wild plant Craig picks when it’s young and tender. And there’s edible sumac, a sour red berry that he steeps in water for a tart, refreshing pink beverage. “When I was a kid, I would eat the berry on the spot,” he says. Craig also fills his basket with juniper berries, acorns, gooseberries, strawberries and oxalis, a wild leaf that tastes like a sour green apple. The interplay between traditional and modern is what makes Craig’s menu fascinating. Some dishes appear under their romanized Apache names: The gazpacho-esque chilled tomato soup with quinoa and mint, for instance, is Itoo’ Chínk’ózhé, Sik’az. Those words tell a story—one about the time when tomatoes went by a different name and ancient culinary geniuses made use of their deliciousness.